The reasons for humanity’s interest in asteroids and how their motion can be controlled, was discussed in Strathclyde’s final Coffee House Lecture, as part of the University’s 50th anniversary celebrations. 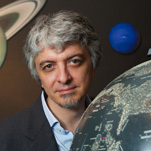 Professor Massimiliano Vasile, Director the University’s Advanced Space Concepts Laboratory, also considered whether the risks they present to Earth can be converted into opportunities to expand the boundaries of space research. Professor Vasile leads the international Stardust project, a European Commission-funded network using cutting edge engineering and mathematics to create new technologies to address two of the most challenging issues in space science: space debris removal and asteroid deflection. The experts working with Stardust are changing global policy in terms of space activity as well as training the next generation of scientists, engineers and policy-makers. The scheme has 16 partners across Europe and recently expanded with the addition of the University of New South Wales and the University of California Santa Barbara. Members of the Stardust network have also been involved in the European Space Agency’s Rosetta Mission – joining scientists and engineers from all over Europe and the rest of the world to unravel the secrets of a comet.